If you take the time portal inside Lavos's shell after you defeat the outer portion in the Black Omen, you'll wind up back at the End of Time, where Gaspar will congratulate you on freeing Zeal. Also, all the villagers who previously commented on the Black Omen will now just talk about the weather instead. Depending upon which period you destroyed the Black Omen in, you may be able to go back and face it again, but all the bosses will be gone except for Zeal herself, and Lavos's outer shell will already be destroyed. There's not much left at this point aside from fighting Lavos, although you can collect clones and Poyozo dolls for everyone if you want, as mentioned in the last chapter. Keep in mind however, that if this is your first time playing through the game after you beat Lavos, since you went through the Black Omen you'll be able to start a New Game+ carrying over all the old data from your game. A few special items don't carry over, and none of your money carries over, so if you want to save your cash you should probably spend it all on items you can sell. Medina after you defeat Ozzie offers the best rates on items compared to their resale value. When you're ready, fly the Epoch into Lavos, take the bucket at the end of time, or go through another version of the Black Omen to confront Lavos again. The outer shell will be gone, but he has two forms to go. Laser Beams/Doors of doom open. : Damages your party for about 400 physical damage. Crystal Explosion: Damages your party for about 100-300 fire damage. Obstacle: Damages your party for about 100-200 lightning damage, chance to inflict Chaos status no matter what. Shadow Slay: Damages your party for about 50-100 damage, chance to inflict Poison status no matter what. Flame Battle: Damages one ally for about 50-100 fire damage. Shadow Doom Blaze: Damages your party for about 100-400 fire damage. Evil Emanation/Lavos's Attack Pwr up! : Increases the damage Lavos deals. Span Death/Arm revives main body...: Heals the body for about 1500 HP. Protective Seal/Disables Def Status: Reduces an ally's defense and deals about 100 shadow damage as well as voiding status immunity. Freeze/Stop: Deals about 10 damage to one ally and attempts to inflict the Stop status. Cutters: Damages an ally for 50-100 damage. Again with three parts (hands/head), he'll begin the fight with the Laser Beams attack. Take out the arms (right or left) first, then the head. Always heal and remove the chaos affects caused by Obstacle. Not much different than what you've experienced so far. You'll have the same party for this and the next form, so here's what you need to keep in mind: you'll probably want a strong healer, I prefer someone like Frog or Robo who can heal the whole party although Marle does have Life 2, Cure 2, and Haste. You'll need a strong physical attacker since one of Lavos's forms can only be damaged by physical strikes, Ayla's Triple Kick, Crono's Confuse, and Robo's Uzzi Punch are all decent choices. However, the best way to deal damage by far is powerful triple techs or single techs such as Dark Matter, Luminaire, or Flare. Choose your party however you like, if you're going for all the endings you'll probably end up doing this with every conceivable combination anyway, just make sure you equip the best equipment and have status protection. One last comment is that since a New Game+ is based upon the contents of your save file when you save, there's absolutely no reason not to use all the Megalixers and Elixirs that you want, since this is the point of no return. 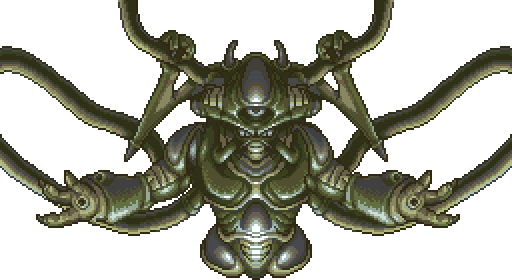 This form has three parts, Lavos' left arm, right arm, and body. The body will have too high defense to damage at first, so just use your most powerful magic attacks to damage the left and right arms. The left arm will probably die first, then the right arm, and the body will remove its defense when it casts obstacle. Heal as necessary, its attacks may do in the 500 range in the best case, and keep wearing it down, it'll break apart eventually. Another cutscene takes place with some dialogue between characters. You'll now do battle with Lavos's final form, surrounded by two bits. Interestingly, trigger abilities such as Lavos core shuts off defense, Lavos core defense restored! and Time warp... can all be counterattacked by Rage Band or Frenzy Band's effect despite dealing no damage to anything. Attack: damages one ally for about 100 damage. Heal: heals Lavos for 1000HP. Drain MP: steals about 10 MP from one ally and gives it to itself. Protective Seal: Voids status immunity. Attack / Will attack with no center bit: a counter attack if you've destroyed the center bit. Punch: damages one ally for 200-999 damage. Crying Heavens/Hidden blow: damages one ally for about 200-1600 lightning damage depending on resistance modifiers, magic defense and which character it is. If the person wears a White Vest/Mail, it heals instead! Time warp...: changes the time period, which changes the background of the fight and is used to determine the super attack used (see below). If you have either the Rage Band or Frenzy Band equipped, you can counter this pseudo-attack. Spell/Random Status (Leene Square 1000 AD): attacks one ally for 150-300 damage and attempts to inflict a random status ailment. Evil Star/Reduces HP by 1/2 (Magus's Castle 600 AD): reduces each ally's HP by 1/2. Dreamless/Ultimate Magic attack (Lab Ruins 2300 AD): deals 100-500 magic damage to your party. Invading Light/Slow (Mammon Machine 12000 BC): damages the party for 100-200 damage and attempts to inflict Slow. Grand Stone/Ultimate phys. attack (Hunting Range 65,000,000 BC): damages the party for about 200-900 physical damage. Prisma Drain: damages one ally for about 100 damage. Lavos Core shuts of def: removes physical and magical defense. If you have either the Rage Band or Frenzy Band equipped, you can counter this pseudo-attack. Active Life / Revives the Lavos Bit!/Resurrect: Revives Lavos Pods: brings both the Left Bit and Lavos back to life if dead. Decreases the defense power of the Right Bit. The Lavos Core's Def pwr restored! : the Right Bit's physical and magic defense increases dramatically. If you have either the Rage Band or Frenzy Band equipped, you can counter this pseudo-attack. A suggested minimum level for this fight is 45. With a lot of practice, it's not hard to solo Lavos with any character at level 55+. This battle can be confusing, so you need to understand your enemy before attempting to kill it. It works like this: there are three bits, but the middle bit looks like a humanoid. This is supposed to make you believe that the middle is the main target, but it isn't! In fact, it's the right bit that you need to focus on destroying. Once you kill the right bit, you defeat Lavos. The only problem here is that the right bit's physical and magic defense is maxed at the start of the fight so you will only do 1 damage if you attack it. Also, the left bit constantly heals, while absorbing magic attacks (however it cannot withstand more than a few physical attacks). The center form, Lavos, will use the most powerful magic and physical attacks in the game, which can kill your entire full-HP party in one hit if you're unlucky. The attack used depends on the background, indicating the time period and theme of the attack (see attacks, above, for details). When one bit goes down, the right bit will shortly lower its defense to charge up "Active Life". This move revives all destroyed bits, but does not heal a surviving bit. After using Active Life, the right bit will use The Lavos Core's Def pwr restored! and its defense will return to maximum, so you have to repeat the process. In spite of that, this can be an easy battle if you know what to do. Start with the bit on the left. Crono's Confuse, Frog's Leap Slash, Robo's Uzzi Punch, or Ayla's Triple Kick will take it out (or a combination of two). Don't use any magic on it or it will heal. Also, don't worry about the Middle Bit unless you know it's about to unleash an "Ultimate" attack (in which case you'll want to prepare healing). The bit on the right is what you need to destroy. Use all of your most powerful attack once it lowers its defense. One thing to notice is that techniques that are amplified by low HP, such as Frog Squash and Dino Tail, will hit all bits for a lot of damage. Just after reviving a character, such as when he/she has 50 HP, you can deal out about 2000 physical damage. Lavos can cough up some brutal attacks (both magic and physical), so make sure you have someone who can heal well, or have plenty of MegaElixirs handy in your inventory. Eventually the destroyed bits will be restored. The left bit can heal the middle bit, so destroy it and go back to attacking the right bit. Once you've destroyed the bit, Lavos will die, the time portal around him will collapse, and you'll see a silhouette of the left bit appear just as you fade away (suggesting it may have survived). Now sit back and enjoy the ending! After the credits, you have two options to wrap up the game. Check out the endings if you want to see other end results, or get ready to start a New Game + (which may be necessary to reach those endings). 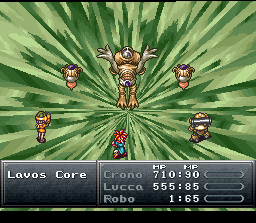 If you challenge Lavos during this chapter, you should get The Main Ending, although you may be able to reach this chapter without Crono as well, in which case you would get The Reunion Ending. There are several variations depending on whether or not you crashed the Epoch into Lavos, spared Magus, and a few minor ones depending on how you completed Fiona's sidequest and how many cats you have. The basic theme of the ending is that Crono and company get honored for their work in saving the past, and have a farewell party. You should also have activated the New Game+ by finishing the game in this chapter, so you can now restart your game with ridiculously powerful characters and try for some of the other endings. This page was last edited on 22 August 2014, at 20:30.